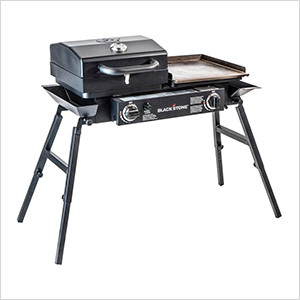 The Tailgater Combo makes the perfect all-purpose cooking unit for the outdoors. Adjustable legs means you can cook on any terrain and stay level. Two hot burners give you the ability to cook different styles at the same time. Go frying pan, stock pot, dutch oven and go for fast intense heat. Throw on the Grill Box and now you’re grilling up to 500+ degrees. Lower your temp and go for the griddle for some flat cooking. Enjoy the outdoors with solid cooking versatility.